A high quality tool designed for use in the installation and removal of tubular brass or steel brake lining rivets, 5/32 of an inch in diameter. Recognized by professionals, this screw type set allows controlled pressure for a proper flare. This reduces the chance of cracking not only the rivet but also of the lining material. It also helps avoid the costly warping of brake assembly back plates and pressure plates, often associated with using the hammer type method. 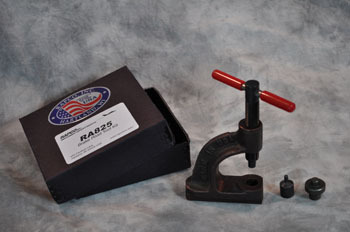 The RAPCO rivet tool is designed to be mounted in a vise or can be hand held. Packaged in a reusable case the RA825 is a quality tool for a professional job. Maximum set travel 1 inch. Maximum working area 1 1/4 inch.